I have selected two representative samples to illustrate my work: SenseAbility, a recently produced multimedia dramatic work, and Tzedakah Box, a series of interactive sculptural story environments. I am including an image for each, and a link to information about the works on my web site. Individual and community responsibility and accountability are central to SenseAbility, Craig Harris’ multimedia dramatic work that explores how personal experiences and cultural narratives help us navigate our ongoing struggle to make sense of the world. Inspired yet haunted by the voice of Elijah, Harris invites the Prophet of all time into our time, imagining him on a shared journey of transformation. Harris weaves music and visual textures with memories of Bethlehem and family connections in the West Bank. An immersive sensory landscape surrounds the audience with the sounds, sights, smells, tastes… even the touch and feeling revealed in the visceral experience that is inescapable in a life under sustained occupation. How is destiny revealed in the face of scarcity and uncertainty? How is resilience, even joy, possible under such challenging circumstances? Can we imagine the Prophet Elijah as another sojourner on our pathway toward greater understanding? Despite a constant struggle to be one’s best self in the malaise of loneliness, doubt and oppression, Elijah beckons us to take up our mantle and discover what is possible. SenseAbility is designed for presentation in diverse venues, and includes a discussion component that explores the themes presented in the show. Tzedakah Box is a series of interactive story spaces – sculptural story environments that integrate sonic and visual elements into an immersive environment that present people’s personal stories, pearls of wisdom, memories, innermost thoughts, and poignant moments. A tradition of charity exists in many cultures, and is central to the society’s concept of love, justice and ethical behavior, linking the individual and the individual act of giving directly to the social fabric. Tzedakah Box story spaces celebrate the interaction that integrate the individual into his or her community, and honor the gifts that individuals bring to their society. Offerings were collected from people of different ages and backgrounds, and a soundscape reflects the echoes of their presence. Artist Candy Kuehn created the sculptures, and Craig Harris created the multi-channel sonic world and interactive structure to integrate and present the stories. Tzedakah Box I draws upon a sand and sea theme, reinforcing the ancient and constant interplay between water and earth. Tzedakah Box I was formed on the image of the Tree of Life, utilizing a paper clay glazed tree structure defined by tree limbs hung with large painted and designed fabric “leaves”, representing life’s seasons. My work employs music, inter-media performance work, creative story spaces, and arts-based community development to promote healthy individuals and vital, sustainable communities. The creative impulse is built on the foundation that the arts play an important role in addressing human challenges and breaking down traditional barriers to communication and problem solving. In the exploration of issues important to humanity, the work is intended to disrupt the status quo and engage people in process, conversation and community action. Immersive artistic experiences cross traditional genres and disciplines, welcoming many artistic styles and embracing technologies old and new. 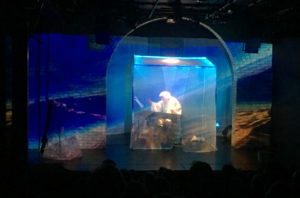 The work brings together performing artists in theater, dance and performance art; musicians from different backgrounds; and practitioners in art, science, technology and human behavior. The result is a distinctive configuration that calls for artists and audiences alike to act—to interfere—constructively and collaboratively, deepening community conversations and paving the way for change. Craig Harris (Composer & Theater Artist) – Craig Harris is the Artistic Director of Interference Arts and is a composer, designer, performer and writer. 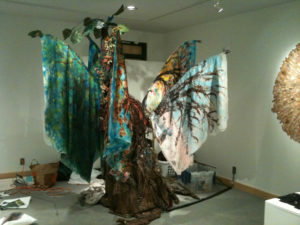 Harris creates multimedia dramatic stage works, interactive sculptural environments, and creative story spaces. He is a recipient of the 2016 Right Here Showcase Commission, and has received grants to support his work from the McKnight Foundation Next Step Grant, the American Composers Forum/Jerome Foundation Composers Commission Project, the Hanson Institute for American Music, Rimon: the MN Jewish Arts Council, the Howard B. and the Ruth F. Brin Jewish Arts Endowment Fund. He has collaborated as composer and designer with many artists and organizations, including dance theater companies Ballet of the Dolls, Zorongo Flamenco, Off-Leash Area and Katha Dance Theatre. As Executive Director of Ballet of the Dolls and the Ritz Theater Foundation, he led the initiative to renovate the Ritz Theater in Northeast Minneapolis. He was Managing and Interim Director at the Playwrights’ Center, President of the International Computer Music Association, and Executive Director of the International Society for the Arts, Sciences and Technology. Harris received a Ph.D. in Composition at Eastman School of Music.